In Legends of Yore you play a hero in the mystical land of Yore. You adventure around this world, killing evil monsters and completing quests for the inhabitants. As you develop you will gain new skills and access to other areas. Your adventure is limitless and this is your chance to become a Legend. As a new character you need to select a starting class. This class defines what sort of player you are. The three different starting classes are described below. Note that at a later point you can change your class into one of the advanced options. The warrior is a brute force player. He's a master of close combat and expects to be in the center of the fight all the time. He special ability, rage, allows him to complete bonus attacks in melee combat. However, the warrior is prone to be attacked from a distance. The archer is a strategy player, he relies on distance attacks and laying traps for his opponents. His special ability, zen, allows him to focus on a target and hit specific critical zones. While the archer's main focus is ranged attack he can still develop a good level of melee combat and wear many armor types. The wizard is the master of the mystic arts. He relies on magic spells to defeat foes. In close combat he is very weak, but with ranged magic the wizard is the most powerful attacker in the game. He relies on his special statistic, charge, to cast the spells however so is prone to being left open to attack if not carefully monitored. On the main game screen you'll see several things. In the center is your character. To the left are bars showing the levels of your statistics. To the right there are tabs to allow you access other screens, and finally to the bottom left are the quick slots. To move tap the location on the screen you wish to move to. If your character can find a path to the location he will move there. 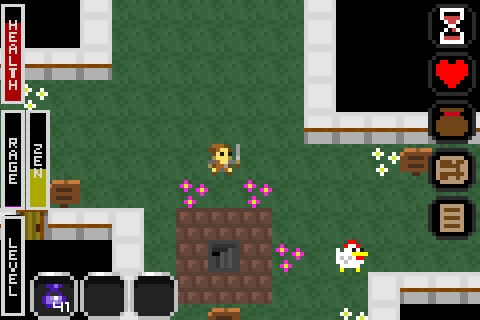 Alternatively, you can use cursor/arrow controls to move. To turn these on select the options tab (the 5th tab down). Toggle the cursors on and press the top tab to return the main screen. You can now use the on screen arrows to move your player around. To attack an opponent tab on them. If you are a melee fighter your hero will move into range and attack the opponent. If you are a ranged fighter you will take a shot at the opponent from your current location. To talk to a inhabitant/NPC click on them. If you're not close enough your hero will move into range. Once in range the conversation will begin. Main View tab - Use the tab to switch between the main view and other tabs. This button also serves at the "wait" button while in the main view. If you wait the game will take a turn while you do nothing. Statistics tab - This tab shows your current statistics and allows you access to the quests screen. Inventory - This tab shows the items you are carrying currently. More details below. Map - This shows a map of your current location. The map is automatically filled in as your travel around the area/dungeon. Options - The options tab allows you to configure the game. Music, Sounds and Cursors controls are here. The game will automatically save as your move around the world. However, if you feel the need to save then there is a button on the options screen to achieve this. 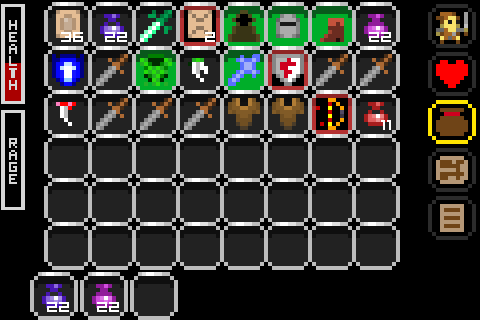 The quick slots at the bottom left of the screen allow you to use or equip items quickly without swapping to the inventory screen (more on items later). The items in these slots are used by a single click or tap on the slot. The world of Yore is filled with many varied items, some simple and some magical. Each item can effect your hero in different ways. Items can be retrieved from quests, chests and monsters. Some can be bought and sold. The inventory tab shows the items your hero is currently carrying. It can be accessed by tapping/clicking the bar icon on the right hand side of the main screen. Each slot in your inventory can hold one type of item. However, some items stack into piles. To select an item simply tap or click on it. Once an item is select a short description will be shown at the bottom of the screen. The options available for that item will also been show at button at the bottom of the screen. Tapping the "INFO" button will display a separate screen listing the complete set of information known about the items. Some items have very limited information but there are other resources that may help you gain more information. Some items can be equipped. Equipping an item means using it by wearing or wielding it. The most common items to equip are weapons and armor, although there are some variations on that. Some items can be used. This generally means using the item up for it's desired task and will often result in the destruction of the item. For instance, using an apple means eating it and healing your hero a little. To assign an item to a quick slot first tap the slot you wish to configure. Next tap the item to place in the slot. The item will appear in the slot and will be useable from the main screen. 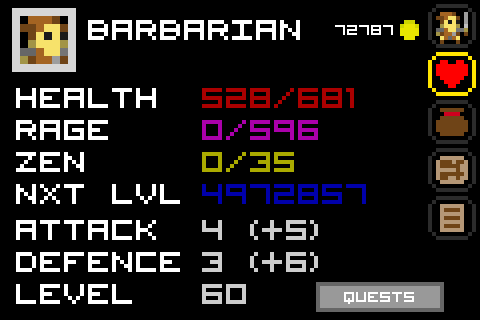 The statistics tab can be accessed by tapping or clicking the heart on the right hand side of the main screen. The statistics tab shows the abilities and levels your hero has. As you change equipped items and gain experience the statistics screen is updated. As your hero adventurers around he gains experience. Experience is gained by killing monsters and completing quests. Once your experience is at a given level you will progress to the next level. When you gain a level you gain statistics and the ability to use new items. In Yore the hero becomes better by being able to more sophisticated equipment rather than just flat statistic gains. Hit points describe how much damage your hero can take before death. Once your hit points reach zero your hero will die. There are many items in the game that can heal your hit points as you adventure. Charge is used by magic users to cast spells. However, each hero has a limited amount of charge and so it should be used carefully. Rage represents the warrior's anger as he fights. Every time the warrior is hit his rage rises. The higher level of rage the more likely the warrior is to use one of his special attacks in combat. Zen represents the archer's ability to focus on a target. If the archers pauses before entering combat his focus will rise and he's both have a better accuracy with ranged combat and a higher chance of getting a critical hit or other special attack. Attack describes the characters offensive capability. Base attack is defined by the class choice, however it can be extensively modified by equipping items. Defence describes the characters defensive capability. Base attack is defined by the class choice, however it can be extensively modified by equipping items.